Please note: I do not hold any ill will towards any of those people mentioned on these pages. It was their choice to condone and/or participate in the behaviour detailed, I understand they just wanted to earn money to feed/shelter/care for themselves and their families – but that does not make it RIGHT. Those that I already knew and considered friends or colleagues (before they received corporate cheques from HBOS) are not directly responsible for my losses or harm caused, though they certainly didn’t help either (they just aided and abetted and refused to question). The most important of which was my long-term ill health since these incidents (lasting the last few years). No documents were ever provided to justify their use of force, harassment and lies and no-one contacted me to apologise with hindsight. Everything on these pages is TRUE (backed up with documentation and sworn statements) – and the offer stands to all parties to request I remove anything that is dishonest. I was hoping they would have done this by now, so we could all be at peace about the past. So this remains as a permanent record for people to witness and those involved to look in the mirror and see if it makes them proud of how they behaved and if they have grown or wish to change. There are many honest ways to provide for yourself and your family, I just hope they make those choices more often than not in the future. I hope I’m not the only one who believes we have a responsibility to each other as human beings to be kind and good and do the right thing – that those that will do almost anything for money by stating they were ‘just following orders’, will one day see this truth too. Has Dennis Goodridge closed Gallery HD1 and gone out of business again? Or just moved offices after another Voluntary Arrangement with one of his business names? Whilst being the money collector for Kevin Oliver/HBOS, Dennis and Gallery HD1 were fully aware of the illegal and unlawful activities they were party to at the properties but continued to partake, for the ‘easy’ money. Kirklees Council sent council tax exemption forms for 8 Queens Road properties indicating they are Council Tax exempt. Remember Kevin Oliver and associates have been collecting money for themselves and not accounting for it. Also to remind you that it was Kirklees Council employees that accepted money (bribes) from Kevin Oliver (working on behalf of Lloyds TSB HBOS Halifax Bank Of Scotland) so he would NOT have to comply with the Law and HMO regulations. Yes that is correct, Kevin Oliver failed to comply with the law and PAID KMC to look the other way. Continued harassment from Bank Of Scotland. This is on the public record but HBOS management are still hungry even after their illegal and unlawful actions (as detailed on this site) that they were complicit in, hired third parties to do on their behalf and ignored reports of. Spoke to JW at Drydens Fairfax and have asked him to respond in writing to confirm they have told their client to cease further harassment. In the second half, Max interviews HBOS whistleblower, Paul R. Moore, about the book he is writing, “Crash Bank Wallop”, and about the latest in the case against HBOS, the bank which required tens of billions of pounds of taxpayer money. “Mr Southwell was first appointed as a director of CJS in 2002. His lawyers stated that he was a “non-executive director” and was installed “at the direct request of HBOS”. This is how HBOS works with it’s agents to help them ursurp from struggling businesses to pay their ‘friends’ – like in the example of Laura Falconer at HBOS hiring Kevin Oliver of Hexham and his Associates, as described on this site. After Kevin Oliver bribed (paid Kirklees to not issue HMO licences and to not enforce the law), I have been contacted by Kirklees Council today to let me know the properties are still council tax exempt. Boultons staff were unable to sell the houses and failed to make a sale since March 2010 (houses unsold by Boultons even after 3 years of marketing). Is that because they have been using dishonest means and lying? I believe so! After the Bank of Scotland refused offers for £800k and an offer for £750k at Auction, it is believed that sources at Boultons have sold the property to a Dr Ishtiaq Gilkar, whether they have disclosed the actions taken by Kevin Oliver and Co. and the second charge on the property is unknown – these and other unresolved matters are detailed on this site and documented as well. Also the fact that the ‘chattels and contents’ legally belong to a third party, that they forcefully took (stole) and Gallery HD1 are using to collect rents from students. Did they sell this too? Please note that details on this site are not just about a Civil matter but law-breaking and criminal activity including (but not limited to) – breaking and entering, fraud, theft, harassment, human rights violations, assault, illegal eviction, perjury, lying to police officers, destroying evidence, refusal to provide evidence or personal records. If you are offered this property for sale by Boultons or Kevin Oliver on behalf of Laura Falconer at Bank of Scotland, all of those involved have been made aware of this site – and I believe it is their legal obligation to inform you of the existence of this permanent website, detailing their wrongful actions, illegal and criminal behaviour, carried out at 8 Queens Road. All the parties involved were informed that their actions were not warranted and that there is no Court Order in place giving any party the right to interfere in the owner’s affairs or harass tenants for money, invade their home or to evict them. These facts apparently do not apply to Kevin Oliver, who has financial and legal backing from Bank of Scotland to continue to abuse the law. They have been funded by tax payer bailed out Bank of Scotland (HBOS, now part of Lloyds TSB). This makes it a matter for public concern and the fact that they probably operate like this against many other home owners – by hiring people to pretend to be Agents for and mis-represent the property owners, whilst acting in the interests of their employers at the Bank. Kevin Oliver and his agents John Annetts, Gallery HD1, Boultons, Shield Security and the other agents who all said they were working and acting for the Bank of Scotland, willfully and knowingly participated in these actions after being informed of this. It appears that one of the things that will make people NOT do the right thing is to receive money to ignore the truth and do as they are ordered (by Kevin Oliver, who was hired, paid and instructed to do jobs for Laura Falconer, Bank of Scotland). These people have all acted against the interests of the property owner and for their own benefit and Bank of Scotland. If you don’t believe it, contact them and ask if it is true. I would recommend you record the conversation or get it in writing – as you will see it is not something that they wish to discuss. I would be embarrassed too and not want to incriminate myself further if I was them. All the parties involved have been informed of this website and have not taken any legal action to save their ‘good’ name. As the only evidence they will be able to provide is that these allegations are true, they ignored questions relating to the matter, they lied and they refused to provide evidence lawfully requested. Their ultimate master Lloyds TSB CEO Antonio Osorio, having been informed of the activity of people hired by Laura Falconer of Bank of Scotland, has failed to do anything about it and condones it by allowing them continue their actions for the Bank. The only way they can fairly and reasonably have this site taken down is to take the owner to Court and provide evidence on why they failed to communicate with him and refused to provide evidence and documentation. The other way is that HBOS lawyer Paul Twomey may try to pay a Judge to issue an injunction whilst asking the Judge to ignore ALL evidence on this site and already provided as sworn statements to the Courts, the Bank of Scotland, MPs and other third parties. (This is what a dishonest person/company would do to try and cover up the truth). This information is public domain and the allegations have not been contested by the named parties. They have also failed or refused to provide evidence to suggest these actions did not (and are not) taking place. September 2013 Update: After the Bank of Scotland refused offers for £800k and an offer for £750k at Auction, it is believed that sources at Boultons have sold the property to a Dr Ishtiaq Gilkar, whether they have disclosed the actions taken by Kevin Oliver and Co. and the second charge on the property is unknown – these and other unresolved matters are detailed on this site and documented as well. We look forward to seeing what the Land Registry shows as the purchase price. If it is less than £750k then you can only speculate as to how they came to agree such a deal and what was exchanged by the parties involved that stood to profit. We’re not suggesting those involved accepted money to agree one deal over another, as that would be libellous, although read on to find out how Kevin Oliver, Boultons and associates destroyed evidence, refused to provide personal data, broke into property, harassed, assaulted, illegally evicted residents AND lied to Police about their actions and intentions without a Court Order. The CEO of Lloyds TSB/HBOS, with this knowledge, has financially rewarded/paid those involved for these actions. – HBOS has failed to provide certified copy of any contracts or notices that their Agent Kevin Oliver is acting on. – HBOS / Kevin Oliver have failed to provide any court documents, notices, warrants to show they are acting lawfully or legally. – All Bank Agents and parties listed on these pages have refused to provide any documentation, even those entitled to by LAW with regards to the Data Protection Act and Data Subject Access Request. In brief, it has been 3 years since a man called Kevin Oliver from Hexham claimed he had been hired by Bank of Scotland (HBOS) to “HELP” the landlord at 8 Queens Road properties. This is how he has helped over the last 3 years. – Kevin Oliver has lied and mis-represented himself as the landlord’s Agent whilst working for HBOS. – Kevin Oliver has used fraud and fraudulent documentation (no original copies have been provided even though requested) to take control of property and money. – Kevin Oliver’s agents ‘Gallery HD1’ have broken into property and lied to police and the public. – Denis Goodridge and A-k have used lies to rent property accessed unlawfully to split the stolen income between themselves and Kevin Oliver. – Kevin Oliver has bribed Kirklees Council officials to NOT issue HMO licences to properties, effectively ignoring the legislation and law on property rental. – Kevin Oliver hired John Annetts and ‘Shield Security’ to take more property by force and install their agents in the property to harass residents on a daily basis, this includes emotional harassment, leaving them outside in the cold, following them round the property, intimidation and assault. – ‘Shield Security’ have concealed and destroyed evidence and personal records as part of their work for Kevin Oliver. – Illegal eviction activity was reported to the ‘bribed’ department at Kirklees Council but they failed to investigate. – Raymond Butterworth of Boultons has also been involved in the illegal eviction process. – Kevin Oliver issued a CCJ against one of the residents – and when, due to extortion, the ex-resident tried to clear the amount to protect their reputation, Kevin Oliver REFUSED to accept the payment. – Kevin Oliver has cost the property owner an income of £10k per month, totalling £370k at this time. Plus loss of equity which remains to be calculated. – He has been responsible for all expenses or fees generated and created in his work for the Bank of Scotland, this figure may be disclosed once they provide proper accounting. – HBOS has not made any losses as they have been unable to provide any certified contracts or full accounting to show source of any funds they claim are due. Update: 23rd November 2012 – As I am not funded by the Government and not able to print my own money (like HBOS), I am unable to afford to take those named to court and get resolution of the illegal and criminal actions detailed here. Their representatives’ actions have included breaking and entering, lying to police officers, harassment, assault, human rights violations (to name a few). This has caused me illness and dis-ease, which I am no longer willing to tolerate to continue the game that they are playing. I have failed to get an honest response from those named or a rebuttal to the allegations – or any sworn evidence to suggest these things not having happened (which they did). This website will remain live as a permanent record. Detailing the names and actions of those involved, as it is a true record of the behaviour of individuals and there respective companies – hired as Agents and funded by Laura Falconer of Bank of Scotland – and condoned by CEO Antonio Osorio, with his office ignoring the serious allegations and evidence provided! NOTE In the interest of honesty and open-ness: All parties named and the people that violated my privacy and my rights have been informed about the existence of this website and the information on it – but they have failed to comment; as that would either they either have to tell the truth or further lie without being able to support it with evidence. 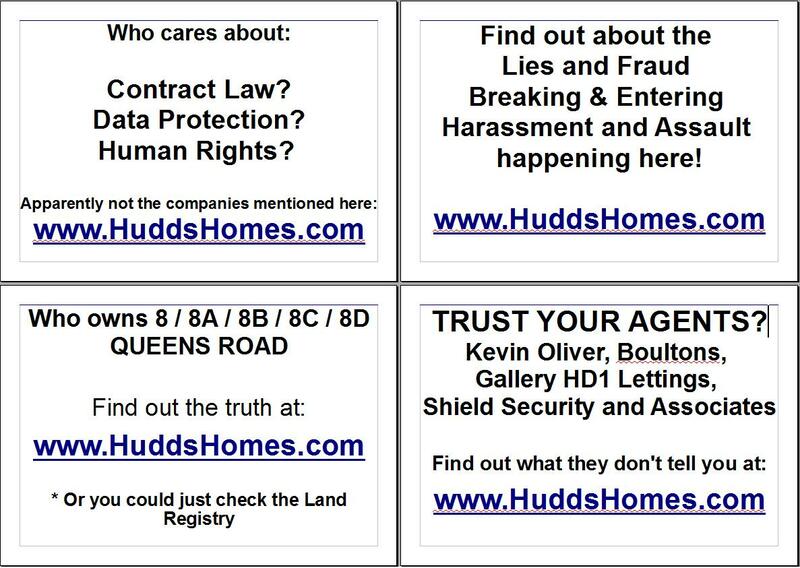 – Boultons Estate Agents Huddersfield, Gallery HD1 Estate Agents, Shield Security UK Ltd, Kirklees Metropolitan Council (to name a few), can be morally compromised and are prepared to ignore the truth and not do the right thing, as long as they are receiving money to justify their actions. * The right thing, is what the average person and common man, know to be right and true. Share this site with your family, friends, colleagues and anyone that may be dealing with or affected by the people and the companies they operate. Raise awareness and watch out if they ever come knocking!! Share your stories online if you have been lied to, wronged or screwed over by any of those mentioned – remember to keep it factual. Sharing with the world will make them think twice before committing such deeds in future and maybe even have them question their integrity – hopefully making life changes that are more honest for themselves, their families and society. It is estimated that since September 2010 around 27 months of income x £5000 = £135,000 has been collected and concealed by Gallery HD1. The exact figures have not been disclosed to me, the owner of the properties, by Dennis Goodridge and A-k – or through Kevin Oliver and Laura Falconer who hired them. Update: 23rd October 2012 – received pack of info from Ombudsman. Note attached “There are elements of the file provided by the business [HBOS] which are marked as private and confidential and which it objects to my providing”. I was also informed separately that the Bank did not provide any certified evidence, documents or sworn statements, just photocopies of documents and loose dishonest emails from those involved with no sworn statements. Email dated 2nd July 2010 – from A-k (Gallery) to his handler/employer Kevin Oliver, who then forwarded to his handler Laura Falconer at HBOS. In it there are false statements made by A-k, which can all be verified by video footage. A-k of Gallery HD1 lied to those parties paying him and Police. Email dated 3rd August 2010 – Kevin Oliver reporting back to his solicitor Paul Twomey and employer Laura Falconer HBOS, with report from John Annetts Property Service Manager. 7th July 2011 – Case Handler notes from Jo Crockett mentioning not showing up to view actual documents. Note: These alleged documents are in London and HBOS Solicitor Paul Twomey REFUSED to send certified copies. My belief is these documents do not exist or they do not want to provide any incriminating evidence about possible HBOS (il)legal operations. Once again the human rights violations, harassment and assault were not detailed in this Ombudsman report. The Ombudsman has chosen not to look at or comment on this aspect. Update: 15th September 2012 – The owner/landlord still has no Agents that he has hired to represent him or the properties in question – if this changes in the future, this statement will be removed from this website. Anyone claiming to represent the owner or landlord is lying unless they are able to show you an original contract with the owner’s name and signature or a certified sworn copy of such a document. These liars who have failed to provide such genuine documentation or evidence include employees and Agents of Laura Falconer (HBOS), Kevin Oliver (Hexham), Christopher John Annetts (J & D Property Solutions Limited) Dennis Goodridge / A-k (Gallery HD1), Raymond Butterworth / Michael Sellers (Boultons), Peter Heppleston / Waqaas Majid (Shield Security) to name a few. go down on public record as being untrustworthy and dishonest people that will violate civil and human rights. Currently these activities are still going on privately! There is always an open invitation for anyone with a conscience at Lloyds TSB, HBOS or working for the Government to come, see and experience for themselves what is being done in the name of ‘Bank of Scotland’ in Huddersfield. See your bailout pounds at work! It is encouraged that you ask the following parties questions and to provide any evidence about who they work for, what allows them to be there and who told them to behave the way that they do. All the parties involved are aware of this website and have been asked to provide evidence that they are acting lawfully – they have all failed and/or refused to do so! How much would you need to be paid to behave like this? What would it cost for you to stand there, see what is going on and then look the other way? The actions of Bank of Scotland (parent company of Birmingham Midshires and now owned by Lloyds TSB), Boultons Estate Agents, Gallery HD1 and Shield Security, show that these parties are not interested in the rights of property owners, tenants, residents or basic human rights. Companies such as Gallery HD1 (and other Bank of Scotland agents) have lied to tenants and Police but when requested to put anything in writing, they have refused/failed to do so. If you should be unfortunate to be contacted by anybody claiming to represent an interest in the house that you live in, you should request that the people who speak to you provide copies of their identification, certified copy of any contracts that they rely on and record what they say or ask them to put it in writing. You do not have to let them into your home or answer their questions if they cannot confirm who they are, provide the documents requested or a court order. Take a photo of them if they are unable to or refuse to provide any ID and also seek independent legal advice. Can you trust Bank of Scotland part of Lloyds Banking Group if they hire people who break the law but fail to see or acknowledge the facts and actions of wrongdoing? Hopefully you have no business with them that you find out the hard way too -as they will charge you for the privilege of being harassed and lied to as well! Squatters who take over empty homes face being jailed under new laws. People who squat in any residential property – even if it is vacant – risk prison terms of up to six months. Do you have permission from the homeowner to be living in your house or just lies and fake documents from those who have broken into the house? Ask for sworn certified copies of any documents, contracts and agreements first, to protect yourself in court. (5)A person convicted of an offence under this section is liable on summary conviction to imprisonment for a term not exceeding 51 weeks or a fine not exceeding level 5 on the standard scale (or both). I still do not understand what the Bank of Scotland and their Agents are doing in and with my properties! They have forced entry, lied, harassed, ‘created’ documents, assaulted and destroyed evidence and personal data. They have also failed to explain their actions, answer questions or provide evidence. Having been made homeless over a year ago by the Bank’s Agents through force and harassment, it is time to move on with my life. They have not taken me to court and their private actions continue, with the court system demanding payment to look at the matter – allowing their actions to quickly escalate from civil damages to criminal and human rights violations. So I can only tell as much truth as possible, to as many people as will listen. The Bank CEO’s may think they are ‘Too Big (and Rich) to Fail’ and that everyone else is ‘too small to matter’. They forget that everyone has a voice and a right to speak the truth. This website has provided that voice and truth and will continue to reach people as long as you share it and tell them. The events have all been documents along with evidence collected, including letters, photos and videos. The evidence has been ignored by the Bank and it’s Agents Kevin Oliver (of Hexham) and Co. as they continue their unlawful actions having forced the residents out of 8 Queens Road and renting out 8A/8B/8C & 8D Queens Road to pay themselves instead of the owner of the properties. This website is a live account of their activity and a book is being written about their activities. If you are a film producer or director for television or a newspaper / magazine editor – please contact me for full details. If you are a corporate and afraid of being sued for libel by the Bank of Scotland (HBOS) and their associates, for publishing the truth about their dishonest actions, then a ‘Based on a True Story’ version can be provided. I went to check for any mail at 8 Queens Road, HD2 2AE. No mail of course as it has probably been returned, opened or destroyed by Bank of Scotland agents. He informed me he worked for the Bank and when I asked him specifically who had hired him and given him access to the property he lived in (a 19 bed house that we can assume the Bank’s Agents are not renting out but giving to him to stay in, having illegally evicted all the previous tenants). The name of the guy that had hired him and that he personally knew is Dave Peak 07802693672 , he could not remember the name of his company and David Peak’s number is not easy to trace online either. When asked about Kevin Oliver, the man in charge of the gangs, he informed me that Kevin Oliver was the Estate Agent selling the property. Gallery HD1 still have ‘To Let’ boards outside the property so that they can continue to illegally rent the properties 8A, 8B, 8C and 8D Queens Road, HD2 2AE without HMO licences. This is a matter already brought up with Kirklees but the council have decided not to do anything about it as they have already been paid to look the other way. Also, there were signs up on the property for Shield Security, who had informed the ICO over a year ago that they were no longer involved with the property. Shield Security Huddersfield are the Force that assisted John Annetts, hired by Kevin Oliver (Agent acting for Bank of Scotland), to gain entry through intimidation and lies. They then destroyed evidence and refused to provide information with regards to the Data Protection Act. The Ombudsman have also finally responded and said they can’t comment on the conduct of these Agents, hired by Bank of Scotland or do anything about it. The name of the person I have been in contact with is on file – but once again, as he has been pleasant, fair, honest and decent – I will not name him but details are available should anyone need to verify the facts. 10th March 2012 – providing more evidence to Financial Ombudsman because Bank of Scotland were unable (or unwilling) to provide it. This matter has also been brought to the attention of the Financial Ombudsman, local MP’s, Prime Minister Cameron and Members of the European Parliament. It is important to keep the actions of Banks highlighted and visible for all to see, especially when they cut corners, ignore human rights and fail to treat people and businesses fairly or with respect. It has been 2 years today since Laura Falconer (Bank of Scotland) instructed and hired Kevin Oliver to turn up at the properties without prior Notice to take control of them. Since this date the other parties that have claimed to be acting for Bank of Scotland are Dennis Goodridge and A-k from Gallery HD1, who broke and entered into the properties without a court order, having been informed in writing that Kevin Oliver is not th owner’s agent or acting in his best interests and has actually been hired by the Bank of Scotland. As well as breaking and entering Gallery also lied to police officers that the owner had been repossessed and used police assistance to obtain keys belonging to myself, in order to cover up the break-in. Then John Annetts, working with Kevin Oliver, turned up with force (Shield Security) to intimidate and harass residents at 8 Queens Road and to gain entry to the property. This time John Annetts used police assistance to gain entry and change locks by telling officers he worked for Bank of Scotland. The newly installed ‘security’ guards then harassed residents, prevented them getting their mail, assaulted myself and lost, concealed or destroyed personal data relating to myself – as they informed the ICO they do not have anything on file. Convenient! Illegal evictions were carried out by Raymond Butterworth of Boultons Estate Agents, through harassment via Waqaas Majid of Shield Security (see videos) and using false statements. Whilst Kevin Oliver failed to communicate with the landlord and owner of the properties. The Bank of Scotland and their lawyer Paul Twomey have been unable to provide a certified copy of a notice or certified – they have been acting outside the law without a court order and ignoring the serious matters reported to the CEO of Bank of Scotland Lloyds TSB, whilst their agents have covered up personal data and evidence by destroying it or refusing to provide. The Financial Ombudsman requested my personal data file and after many weeks, they were unable to provide it. So much for a system that can be trusted! Instead of removing these people mentioned and dealing with the matter fairly, Bank of Scotland have condoned this behaviour by rewarding those involved with payments for what I assume is services rendered to the Bank of Scotland – for the job that Laura Falconer and associates hired people to do. I dare not think how the Bank of Scotland and it’s employees and Agents would have behaved if the Government had not provided a bail-out to the bank to cover for it’s mistakes and pay commissions/bonuses. I look forward to court, should the CEO (of Lloyds TSB Halifax Bank of Scotland) wish to invite me as it is astonishing how they have compounded their errors, mistakes and continue to ignore what is clear to any fair and reasonable human being – their actions are wrong and the individuals mentioned should be held accountable. All the statements made here are true and all parties involved have failed to provide certified documents or sworn statements to show their viewpoint or how my beliefs detailed could be wrong. Their actions (and inactions) speak louder than words. Around 23rd of January 2012 – Bank of Scotland Twitter @bankofscot_help deleted all it’s past correspondence and referred people to @AskBankOfScot – any reason for change of account and deleting previous recorded tweets? 1st January 2012 – I am still the owner of the properties at Queens Road and am not bankrupt as alleged by Gallery HD1 employees who are working for Kevin Oliver who was hired by Laura Falconer at Bank of Scotland. They have lied and it is believed they continue to lie to collect money from my properties. Parties involved are still using my personal information and property, to take money and bill my name, with the assistance of Laura Falconer at Bank of Scotland. Those people involved have still failed to provide Personal Data as requested or any certified documents to show that the actions they have taken is legal and lawful. This has been requested multiple times and their solicitor cited costs as the reason he has failed to send me copies. They continue to cause me financial loss, distress and embarrassment in Huddersfield with their continued actions. They have failed to stop their behaviour and communicate with me fairly. The Financial Ombudsman still hasn’t investigated this matter fully and we await a response. They are aware of this website and have still not pursued legal action because it would involve them having to provide evidence and justification for the harassment and actions taken by their Agents. Actions which any reasonable and fair person would probably disagree with and possibly label as ‘disgusting’ or something similar. (This is opinion and you should make up your own mind after reading about their actions, watching the videos and asking myself and Bank of Scotland for evidence to verify the statments). This website only contains truth and honest opinion based on my personal experiences with those parties named. This information has been published as freedom of expression (of the truth) and a public service to warn others of the actions that those parties named will take on behalf of the Banks! There is nothing more to say on this matter, other than to publish evidence, the response from the Financial Ombudsman and a copy of the full report. 2pm, 19th December 2011 – Called by Carmel Bowdalo at HMRC regarding tax and where I live. Explained to her that I have been forced out of my home and business by Bank of Scotland Agents who are asset stripping my property and using the cash (via their Agents). They told me that I owe a lot of tax and it is my problem to deal with. I explained it is HMRC’s problem to deal with, as it is them that claim I owe the money. Explained how I cannot fill in my tax returns either as Bank Agents have taken some of my paperwork and probably destroyed the rest – along with other files, computers and personal property left at 8 Queens Road, when their hired thugs came to visit and broke into my house (with Police assistance). Requested that HMRC take me to court and Bankrupt me, as Bank of Scotland won’t take me to Court as it will expose all their wrong-doing as documented and journaled on this website. Given HMRC the link to this website to see issues I’ve had to deal with recently. A full report and publication will be made available to the public on HBOS actions to hire and support their Agents. 14th December 2011 – Financial Ombudsman still haven’t completed their investigation into Bank wrong-doing as they have a larger number of complaints to deal with at the moment. Unfortunately this gives the Banks Agents more time to collect money illegally and destroy further information on their actions. 25th November 2011 – Shield Security have failed to provide personal data, as required by the Data Protection Act, which they collected and provided to Bank agents, even after an ICO Investigation. It has either been concealed or destroyed. ASSAULT, refusing to provide personal data and destroying evidence. All in a day’s work for the Heppleston’s at Shield Security Huddersfield? Tried to call Laura Falconer (Kevin Oliver and Paul Twomey’s Bank Roll at BofS) but her 0141 BoS number has been discontinued and the switchboard can’t find her details on the employee list. So spoke to Joanne Crockett instead, as last contact at HBOS. Joanne Crockett says she has addressed my concerns (which she hasn’t) and I wanted to let her know in case she was confused and thought she had. She said that the bank only harasses people if they have reason to; she does not wish to view the youtube videos of their agents assaulting people, justifying they are there to ‘protect’ the property; she does not wish to discuss no Notice being served for the visit of Kevin Oliver in March 2010 who is dealing with properties on behalf of the Bank. Offered to get their agent Kevin Oliver to contact me (he’d only be 18 months too late to respond to anything I’ve asked him). He does get paid by the Bank regularly though so has good communication with them. She made no comment on many payments made to Kevin Oliver by the Bank (£56,981.03 on 7th April 2011) or to Underwood and Co. from an account in client’s name. Then finished stating she can not add any value to the conversation and to take it up with Ombudsman – thank you Joanne Crockett. Customer service or responsibility avoidance? In all honesty she probably wasn’t expecting or appreciate the call – the Bank should take notice and not do with-held number ambush calls themselves either if they don’t like. 3rd August 2011 – Data request information received showing payments being made secretly to third parties from my account. Did you know the Bank will pay tens of thousands of pounds from customer accounts and not inform them? Have you requested your data file to see what the Bank do behind your back and the lies that they put on your file? Latest Data request still has a huge gap between 3rd March 2010 and 14th June 2010 when they started their alleged illegal activities that resulted in criminal behaviour. They have failed to update the errors on their data file as requested last time. So they still have incomplete and inaccurate information to pass around between departments. Entry on 14th January 2011 Bank comments: “Shazia is looking to confirm the Banks have acted illegally” – as to date no evidence has been provided. Letter sent to Bank clearly stated they should respond in writing as they have proven to be untrustworthy and unreliable. So Joanne Crockett phoned me from a withheld number, without permission to contact me and having been told only to write. Jo Crockett phoned because she may be ignorant, illiterate or because dishonesty is hard to cover up in writing. [Recorded call available for inspection]. Jo Crockett of Bank of Scotland failed to respond to points raised in the letter sent to her, dated 27th May 2011, that she was calling about. All the points are important and she failed to understand that is why I wrote to the Bank and put up this website, thinking that the complaint was only about their agents Laura Falconer, Kevin Oliver and solicitor Paul Twomey. What about the people they hired that harass, intimidate,assault and lie on their behalf? She failed to acknowledge all my complaints sent in my last letter, instead referring to ‘our conversation’ to then create a new ‘understanding’ for herself. 16th July 2011 – Letter received, dated 7th July 2011, from Joanne Crockett (Customer Relations!?) Bank of Scotland. She failed to acknowledge the harassment, assault, lies and other actions reported to them and detailed in the letters sent and on this site. According to her ‘they have acted professionally’. You decide for yourself if those hired by Bank of Scotland have acted professionally, watch the videos and request the witness statements. 11.30am 15th July 2011 – Password protection lifted for easy access due to NO response in writing from Bank of Scotland CEO’s office or MP’s. Financial Ombudsman have written saying they have told Bank of Scotland to deal with the matter. 26th June 2011 – Website Temporarily removed and password protected – to allow time and space for MP’s, Bank of Scotland, Financial Ombudsman to respond. Paul Twomey (solicitor for BofS, Kevin Oliver and other Bank Agents) has provided in writing that John Annetts does not work for Bank of Scotland – and therefore is a liar. John Annetts who ‘they’ hired clearly told people, companies, tenants, residents and Police when he came to the property that he worked for the Bank. Bank of Scotland Agent Kevin Oliver has put in claims against people that do not live at the property on behalf of the owner (!?). If Kevin Oliver was the owner’s Agent, he would have known that these people have left and returned the keys to the OWNER but Facts have never stopped Kevin Oliver, John Annetts or Shield Security lying and breaking the Law. It is another attempt to get money through dishonest means. Kevin Oliver, whose actions do not represent the owner of the property, is still dishonestly claiming that he is acting on behalf of the owner. No certified copies of any evidence has been provided as requested to prove his claims, so it is fair to assume he is not. Raymond Butterworth claims to have served notice on the people at Queens Road – there is no evidence available or been provided to back up these claims. Is he as dishonest as Michael Sellers from Boultons, who wrote that he would redact (remove) any personal information if he had to provide my Personal Data? Butterworth has mentioned that an employee of Shield Security witnessed the delivery of said notice and has video footage ‘to provide’. It is likely that no such footage exists or has been provided. Note that Shield Security destroyed evidence (a certified copy of a sworn statement) placed on the notice board in the property, for tenant and public information, as a statement of truth. They have also failed to provide personal data when requested (even after having informed me that it exists). You can also see the actions of this employee in the Youtube videos on this site. Would you trust him to tell the truth and believe what he says if he (and associates) do not provide evidence? It appears that these parties can write what they want and are willing to lie. Room 18 was locked by the previous tenant, as I was present and keys were given to me. It was then FORCED open by Shield Security on 7th February 2011. Shield Security have then lied on a report to cover this fact stating door was open. Notices were removed from the front window and the door frame was damaged (video footage available). It is likely that the person that entered the room with force is the ‘hot-headed’ Waqaas Majid (only Shield Security can confirm this). This man has harassed and assaulted people in their home, see videos on this site. Tenants returned their keys to me, the owner, when they vacated as it is clear from events at 8 Queens Road, that no-one wants to deal with the harassment, threats and intimidation of Shield Security. I have possession of 8 Queens Road as owner but Shield Security have taken possession by Force. Note that I have also been forced out of my home by harassment, violence and refusal to allow me entry by Shield Security who claim to be working for Bank of Scotland. Shield Security have not provided any evidence on who they work for and take orders from (apparently it is legally John Annetts, who works for Kevin Oliver who is NOT acting on behalf of the owner) but they believe they work for Bank of Scotland. As everyone else acting at the properties state the same, it is fair to assume they have been told this for a purpose and has truth to it. Telling them what Kevin Oliver claims (to be the Agent of the owner) would just make him look like a dishonest hypocrite and any reasonable person, or Court, would not be able to or be willing to follow his orders (see video evidence for starters) – unless it was for a financial or other incentive. I am of the opinion that Bank of Scotland’s lawyer Paul Twomey does not value honesty. He has told half-truths whilst ignoring the full facts. For example he has stated that I have not been harassed at my ‘correspondence’ address – and omitted to acknowledge that I HAVE been assaulted and harassed at the property where I was living as detailed here. He is aware of this website so it is strange he should not be able to see or have access to all the facts which have also been provided in writing to all those claiming to work on behalf of Bank of Scotland. You make up your own decision about whether lawyers in general can be trusted or are honest from your own experiences. Please note ‘Lawyers do not lie. They bend the truth, avoid the truth and never let the facts get in the way of a good defence’. Even though this criminal behaviour has been reported to Bank of Scotland, their employees continue to work with these Agents that they initially hired and contracted to do a job for them. Is it possible that those involved value money over honesty and doing the ‘right’ thing? You probably know the answer to that question. You make up your own decision about whether you can trust your Bank from your own experiences. 27th May 2011 – Letters sent to Antonio Horta-Osorio (new CEO of Lloyds TSB), MP Barry Sheerman and Rt Hon David Cameron MP and The Financial Ombudsman. As Bank of Scotland do not seem to want to comment on the matter or send a full response to another letter sent to them end of March 2011 detailing more, continued harassment. Shield Security have refused to provide personal information requested in a Data Subject Access Request. They have been reported to the ICO (The Information Commissioner’s Office) for their further failure to comply with the law and we await a response from ICO. The criminal behaviour of those involved has also been reported to SIA (The Security Industry Authority), Kirklees Council, TPOS (The Property Ombudsman). We are still awaiting a response from a couple of them and Bank of Scotland. 31st March 2011 – Sharon Hoy Bank of Scotland, wrote a letter referring to “the repossession of 8 Queens Road”. She also does not seem to know what the Bank of Scotland’s position is on the matter of the Agents they’ve hired to take control of the properties that I own! I believe the profile has been created by someone at Shield Security who has low literacy and communication skills, that takes their job so seriously that their company still refuse to provide any personal data collected about myself and yet continue to harass me away from the properties. The photo used for their fake profile suggested I would “get pawned” (threat of getting physically beaten up) and on at least two occasions they made me aware of their presence and harassed me online, on 15th February 2011 and Wednesday 16th March 2011. These are the kind of people that Bank of Scotland are hiring with your (taxpayers) money to harass us. The Bank does not care about people but only looks at numbers, human rights are not as important as profits. Ask someone at the Bank to put in writing that customers are more important than profits, they won’t do that. The Bank will either ignore what you have to say, deny it by discussing something completely different or pay someone to deal with it. These Agents will say they work for the Bank when it suits them to do so – but the Bank will say they don’t work for the Bank when it suits the Bank! It appears that who has the money makes the rules. Latest – Sunday 6th February 2011: Shield Security entered into a private room that was occupied to remove notices informing the public of what is happening at 8 Queens Road. The Notices were placed on Saturday evening and stated that you should check this website. A lawful protest resulted in them breaking and entering! Here are the Notices that they don’t want the PUBLIC, you, to see! The tenancy for that room is on file and available to law enforcement and the Press to examine. They had no right to go in this person’s room – but clearly the law does not apply to Shield Security, Agents of John Annetts (associate of Kevin Oliver) who claims to be working for the Bank of Scotland! Shield Security have access to ALL these properties and are prepared to enter individual rooms without giving residents any Notice, to remove personal belongings. < and see the 'face' of Bank of Scotland. The Bank Agents removed a For Sale sign placed by the owner – why would the Bank not want the owner to advertise/sell his own properties!? It appears that Bank of Scotland would rather pay (assist) crooked companies in taking around £10,000 per month rather than work with their customers / small businesses. This is where the taxpayers money is going! Their process of accounting and fiddling money on this scale will be provided as soon as they decide to be honest and let the owner of the properties know how much they are paying the third parties that work for them. We are not holding our breath or expecting them to be honest any time soon. Bank of Scotland are aware of this site and the problems at the properties created by their Agents. I, Barinder Gill of 8 Queens Road, Edgerton, Huddersfield, HD2 2AE declare that I have been forced out of business by what I believe to be illegal and unlawful actions of Bank of Scotland and it’s Agents, including Kevin Oliver and his associates. Their actions have caused irreparable harm, injury and loss to myself, my health, my reputation and to my business. The Bank and it’s Agents have all refused to provide certified copies of any documents or sworn affidavits and continue their activities without providing evidence or proof that they are acting lawfully. They have had over 6 months to provide this evidence. It is believed that Kevin Oliver is acting with the Authority of Bank of Scotland and it’s approval, with both parties sharing the same solicitor/lawyer and goal to control the owner’s property. The situation is untenable and basic Human Rights have been violated by these parties! 1. Bank of Scotland did not give proper Legal Notice of the actions they were going to take – their Agent, Kevin Oliver, just turned up on the 11th March 2010. He was not expecting to find the owner in Huddersfield, so it can be assumed that there was no intention to inform him of their actions. – A certified copy of the Notice and Appointment has been requested but no parties have provided this, including Carol Tedman at Bank of Scotland and Paul Twomey (solicitor of Bank of Scotland and Kevin Oliver)! 2. There is no official record, on the information which was obtained through the Data Protection Act, indicating that any Notice was given in March 2010 or Kevin Oliver was hired by Bank of Scotland. – Why would the Bank ‘hide’ that fact? 3. Bank of Scotland’s Agent Kevin Oliver mis-represented himself to the owner of the properties to obtain sensitive information. He is now continuing to mis-represent himself as the Landlord’s Agent even though he has been given notice to Stop. The definition of Agent is clear and Kevin Oliver is not trusted, as he refuses to communicate with the owner. Kevin Oliver and his Agents do not work for the owner of the properties. FACT: The owner is NOT Bankrupt and has NOT been repossessed and there is no evidence to support these lies. 5. Gallery employees committed a Criminal Offence by Breaking and Entering into properties at 8 Queens Road, whilst telling people present, including the Police that they work for the Bank. They then took possession and put their tenants into the properties and are collecting all monies on behalf of Kevin Oliver. Kevin Oliver has not paid any money towards the account that Bank of Scotland say he is supposed to be servicing. It is believed that Dennis Goodridge of Gallery HD1 is illegally managing the properties on behalf of Kevin Oliver – as the properties do not have any valid HMO Licences on display with the Manager’s name, a legal requirement of the Council, to show who the management responsibility lies with. 6. Bank of Scotland & Kevin Oliver’s lawyer, Paul Twomey (of Underwood and Co), has evaded questions and failed to provide evidence for Claim Number 0HD01914 in the Huddersfield County Court. Even though he told the judge it would take a week to get the evidence together and respond, over 2 months have passed and no evidence has been provided on behalf of Bank of Scotland & Kevin Oliver. – Does the Law and accountability not apply to them? 7. District Judge Booth has ordered more money to be paid to the Courts before allowing the case to be heard, even though he has a file to evidence the potential wrong-doings, of the Banks and their Agents, on his desk and NO evidence from them in their defence. – Even Justice has a price! 8. In the meantime, Bank of Scotland Agent Kevin Oliver (and his agent John Annetts) have hired Shield Security to forcefully physically take control, limit access 24/7 and put a lock on the letterbox at 8 Queens Road! These parties have also been assisted by Police Force Officers. 9. Shield Security have harassed and assaulted residents at the property and violated Human Rights. FACT: Shield Security have not asked their employer who is the Rightful Owner of the property, as the Bank’s Agents pay them NOT to ask questions and to do as they are told. – Peter Heppleston (Shield Security) has told the owner to prove it in Court. But he is happy to accept work and payment from people that they believe don’t have to prove anything in Court. 10. Kevin Oliver has tried to evict residents using the services of Boultons Estate Agents and Underwood and Co. Solicitors, whilst they all falsely claim to represent the landlord. FACT: They do NOT represent the actions or wishes of the landlord. Many of the parties involved have lied about the owner, in order to gain control of the properties on behalf of their clients. EVIDENCE has NOT been provided to prove they are acting legally or lawfully. What would you do in such difficult circumstances? If no-one will tell you the truth or provide evidence to back up their lies? If they spread those lies around the community where you live and tell people you are nuts? Do we all not have rights? We are all entitled to voice our opinion but who listens to the truth? This situation can not go on. There will be other people experiencing similar issues. Share the link to this site with them, so that they know they are not alone in this. Bank of Scotland refusing to send certified documents (including the apparent notice sent and the appointment of a receiver) – Right or Wrong? Bank of Scotland not having any such information on my personal data file – Right or Wrong? Kevin Oliver, as Paul Twomey (Bank of Scotland and his lawyer) claims is legally the agent of the landlord, even though in reality it is evident from their actions that he is acting in his own interests and that of the Bank – Right or Wrong? Third parties being informed that Kevin Oliver is not the Agent (acting in the interest of or trusted by) of the landlord but they still ignore that so they can get money – Right or Wrong? Gallery HD1 telling people lies about the owner and breaking and entering into his properties – Right or Wrong? Boultons Estate Agents stating they would rather destroy evidence than provide the owner with his personal data – Right or Wrong? Bank Agents, such as John Annetts, lying and coming round to change locks without informing residents of such a visit – Right or Wrong? Police Force officers claiming it is a civil matter but still assisting the Bank’s agents – Right or Wrong? Shield Security using harassment and Force to control residents and prevent them getting their mail – Right or Wrong? None of the people and companies mentioned have been forced to work with the Bank but have chosen to do ‘business’ with them and continue to do so; despite all the problems and failure to be able to provide the owner with documentation that allows them lawfully to be on his premises. These matters have been reported to the Police, TPOS, SIA, Huddersfield Courts, Kirklees Council. Still awaiting an adequate response. they may be able to buy the silence of people but they can’t hide the whole truth! Personal opinion: It appears that there is no Trust in God, truth or honesty but these parties do Trust in the Banks and the money they will pay you to ask no questions and just do their job. We must understand that the people involved have bills to pay and families to support. What is difficult to understand though is why they will continue to do what is fundamentally ‘wrong’ to other people just because they believe ‘The Banks are trustworthy’. Are people just commodities for sale, that corporations can use and abuse? 3. If someone knocks on your door from the Bank or claiming to represent the landlord, ask for ID and make a note of who they are. 4. If you have any queries, contact the Landlord directly and get legal advice. Inform the Police if it appears that they are not who they say they are. 5. Even though the Banks think they can do what they want, they do not write the Laws of the Land, only a court can do that. They may try to evict you but you do not have to leave your home without a COURT ORDER. Find out yourself if they are truthful and honest. Please note that they may record your phone calls but do not put anything on record themselves. When you contact them, you should ask their representatives for evidence (in the form of certified documents and a sworn affidavit) because they say a lot but write very little! West Yorkshire police have informed us that the issues with Kevin Oliver and Associates is a Civil matter (letter on file) and one Inspector even claims to have seen evidence that the owner is bankrupt and been repossessed (details on file). This is untrue and no evidence has been provided by anyone. Evidence and sworn affidavits can be provided by the landlord to support these statements about the continued actions of the Bank and it’s Agents. This webpage has not been written for libelous or defamation reasons, it has been written so that I can express my truth about the matter and provide a documented record should anything happen to me. If you ask me what has happened to me and my business, I will refer you to this site and then provide more information if needed or requested. There is nothing to hide over here! If you hear any lies from any of the parties listed above, that is anything they say verbally but will not put on record or in writing or provide evidence for – then you can refer back to this page and make up your own mind about the ‘whole truth’. I will update on what the Bank do about this issue, whether they use further lies, more force or actually prove in court that they have done everything in their power to be honest and provide the information requested. We do not recommend that you visit 8 Queens Road by yourself – but if you do go, make sure you have a witness with you. Another page highlighting the unprofessional and aggressive conduct of Shield Security will be added soon. Also one for Gallery HD1 Lettings and Boultons. Legal disclaimer: This information will be redacted (removed) and/or amended subject to Bank of Scotland and all parties involved responding to the letters sent to them and providing evidence that they have acted legally AND lawfully. It is the writer’s belief that they have not done this and they continue to ignore the matter. Anything proven to be incorrect will immediately be removed. Alternatively, someone from the Bank of Scotland can request (in writing) that this information be removed and we will only publish the written and recorded communications between the parties involved. Just a note that there is some potentially libelous stuff in here and you should be very careful… I would advise you review all those parts either stating, alleging or assuming that “Bank of Scotland plc” (or its agents) have acted against any laws of either Scotland or England & Wales. Without a court judgement confirming these, you are getting yourself into potentially deep legal waters. This is an invitation for all parties, particularly the ‘Bank of Scotland’ to provide any evidence publicly, to definitely confirm they are acting legally – as beliefs and opinions can be changed given proof and the ‘Public Notice’ stated above will be amended. We all make mistakes but covering them up and lying is not the way forward. Does that not mean the actions of Bank of Scotland and it’s Agents leads to the deep legal waters – but as they can afford to PAY people, it does not matter? Not giving Notice makes any documents and actions illegal. Lying to the Police and other people is dishonest. Breaking and Entering is a criminal offence. Physical assault, threats and harassment are a breach of human rights. Does the latter come under laws of Scotland, England & Wales? Report them to the police – they are under investigation for many other matters as reported in the Times newspaper 1st January2012 operation Hornet – report all these things to the police. I wish you every success in your to attempt to expose the sckullduggery of HBOS. It is exactly what i am trying to do but it it is a slow and at present unrewarding past time. Sorry for your distress but the actions of exposure need to continue.somethings we can’t walk away from. I am still amazed at the depth of depravity human nature will sink to for power and greed. Better to have nothing and see beauty than to be blinded by riches and mis used power. As a current tenant for this house, I can confirm that some of the information you have put on is true . HBOS do not belong to the proper Lloyds Banking Group, they belong to Lloyds TSB group which does not appear to exist and Lloyds international which is a different company entirely. I believe they are an LLP and not a PLC.